Climate change, argues Liz Durkee, is the most critical issue facing Martha’s Vineyard. Just about every facet of Island planning is affected by climate change: coastal planning, transportation, water quality and fishing, farming, health care, invasive species management, and, of course, the economy. Mrs. Durkee is the Oak Bluffs conservation agent, a member of the board of directors for the Vineyard Conservation Society and a member of the advisory committee for 350 Martha’s Vineyard Island, the local arm of a grassroots organization to spur action on global climate change. In this 15-part series of essays, published in in the Vineyard Gazette in 2011, Mrs. Durkee dissects the causes and effects of climate change on various aspects of the Island, and issues a call to action to all who care about the future of Martha’s Vineyard. Photo of Sarsons Island in Oak Bluffs by Mark Lovewell. That well-worn phrase — climate change. We know it’s out there, hovering over our lives like a heavy cloud. But what does it mean exactly — to you and the Island of Martha’s Vineyard? It means striking changes in the three most critical components of Island life: • The natural environment — the air, land and water; • Our physical well being — our human health; • The local economy. Climate change is complicated; sea level rise is not. We live on an Island — a glorified sandbar — and the sea is closing in on us. It is rising much faster than anticipated. In the last century sea level rose by about a foot. In this century, due to human-induced global warming, it is expected to rise at least five feet, according to a new report by the international Arctic Monitoring and Assessment Program. One day last month close to five inches of rain fell on Martha’s Vineyard. In Chilmark alone it caused a five-foot wide, four-foot deep sinkhole on State Road, the collapse of a two culverts and the dirt road to Lucy Vincent Beach, the collapse of an old granite bridge and the closure of South Road near the Allen Farm due to an impassable puddle. Suddenly it’s flooding everywhere, all over the world — and it’s no fluke. Humans are not the boss of nature. Just ask the residents of western Massachusetts, Joplin, Missouri, or Japan. On the Vineyard we are at the constant mercy of wind, waves, storms and tides. Someone once said that when land and water wrestle, water always wins. That’s why it was refreshing to hear talk, at an erosion control workshop on the Island last week, of erosion management as opposed to erosion control. Clam chowder, bay scallops, fried oysters. Wampum bracelets. Shellfish are the grand bounty of the soft, sparkling salt ponds that ring the Island shore. We’d be hard pressed to find a local cultural symbol more significant than the water-worn purple and white quahaug shell. Purple — the Island color. Eat fish, we are told, they’re good for the body and brain. Eat local fish to support the Island economy and limit the use of fossil fuels used to transport food. But eating traditionally local seafood will become a challenge as marine species struggle to adapt to changes in ocean waters due to human-induced global warming. Some species may not be local for long. Southern New England is overdue for a major hurricane. The last big one, in terms of lives lost, damage and cost, was the Great Hurricane of 1938. A lot has changed since then that will make the next one even more severe. Neither surf nor turf, land or sea, salt marshes are a spongy, mucky, stinky in-between zone full of biting, stinging, snapping creatures. Yet they are stunning to the eye — think Poucha Pond, Mattakesett Bay, Nashaquitsa Pond. And more importantly they are one of the most productive ecosystems on earth. 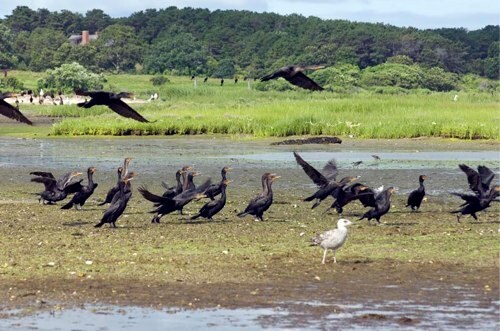 Salt marshes — our local coastal wetlands — provide recreation, jobs, human health and safety protections, and an incredible array of environmental benefits. The Vineyard will be a very different place in 100 years, notes Island naturalist Gus Ben David. The changes in his lifetime have been “phenomenal,” he says, especially the explosion in population and degradation of natural habitat. Tornadoes, an earthquake, the edge of a hurricane — all in Massachusetts, all in one summer. This is unusual, as are the record number of recent floods, droughts and storms across the planet. The natural world is in a climate change flux and even the lush, green foundation beneath our sandy feet is shifting — invasive species are quickly and quietly changing the local landscape. In one quick generation the Vineyard be came a famous summer resort destination. The shoreline and its recreational joys became the drum that beats the local economy. And now that economy is at risk of cracking under the weight of climate change. The Vineyard is too beautiful for its own good, at least when it comes to climate change. It’s hard to look past the shimmering goldenrod and deep autumn ocean to see growing cracks in the Island’s foundation. The soil, trees and plants — the powerful roots of wispy beach grass — keep this Island afloat. The land and sea provide food and shelter. Clean air and water sustain our human health. The beaches and parks, forests and farms, vast water views and bold hydrangeas are the fuel that fire the local economy. This is our foundation.